We recommend checking out our discussion threads on the ASUS PB328Q 32" WQHD Super Narrow Bezel Professional PB328Q, which address similar problems with connecting and setting up Computer Monitors ASUS. The user manual for the ASUS PB328Q 32" WQHD Super Narrow Bezel Professional PB328Q provides necessary instructions for the proper use of the product Computers & Solutions - Monitors & Displays - Computer Monitors. 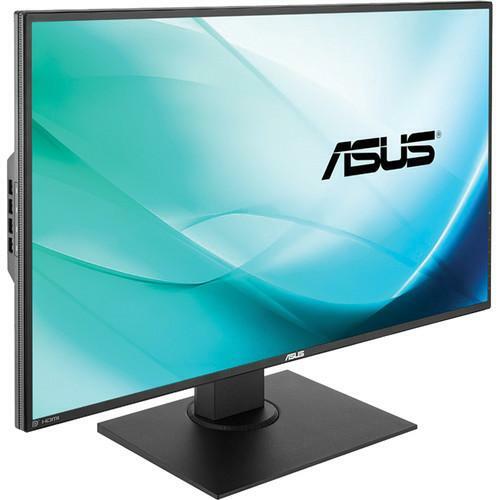 The PB328Q from ASUS is a 32" super narrow bezel professional monitor. It features a 178°/178° ultra-wide viewing angle that eliminates color shift. The PB328Q features a wide color gamut of 100% sRGB designed to deliver high picture quality. The monitor offers 10-bit display color for over one billion onscreen colors and supports a 12-bit internal lookup table (LUT) for smoother gradations and a more natural transition between hues. Additionally, this monitor also features a 100,000,000 ASUS Smart Contrast Ratio for enhanced image contrast. The Picture-in-Picture (PIP) and Picture-by-Picture (PBP) features allow you to view images from different signals in various ways, and lets you switch between the main and PIP source, including audio. The QuickFit Virtual Scale Function included with this monitor allows users to preview photos and documents on screen in their actual sizes prior to printing. It can activated via a hotkey on monitor and used as a guide to accurately view and edit photos. Additionally, the PB328Q also comes with a choice of seven different background colors for you to choose from. This 32" monitor is VESA-wall mount compliant and comes with a versatile stand with full tilt, swivel, pivot, and height adjustment. A user-friendly Quick Release Stand is included for hassle-free setting. The Flicker-free and Low Blue Light features prevent your eyes from fatigue, strain, and other possible eye symptoms that can be caused by screen flicker and hazard blue light. Box Dimensions (LxWxH) 32.9 x 21.45 x 13.25"
The user manual for the ASUS PB328Q 32" WQHD Super Narrow Bezel Professional PB328Q can be downloaded in .pdf format if it did not come with your new computer monitors, although the seller is required to supply one. It is also quite common that customers throw out the user manual with the box, or put the CD away somewhere and then can’t find it. That’s why we and other ASUS users keep a unique electronic library for ASUS computer monitorss, where you can use our link to download the user manual for the ASUS PB328Q 32" WQHD Super Narrow Bezel Professional PB328Q. The user manual lists all of the functions of the ASUS PB328Q 32" WQHD Super Narrow Bezel Professional PB328Q, all the basic and advanced features and tells you how to use the computer monitors. The manual also provides troubleshooting for common problems. Even greater detail is provided by the service manual, which is not typically shipped with the product, but which can often be downloaded from ASUS service. If you want to help expand our database, you can upload a link to this website to download a user manual or service manual, ideally in .pdf format. These pages are created by you – users of the ASUS PB328Q 32" WQHD Super Narrow Bezel Professional PB328Q. User manuals are also available on the ASUS website under Computers & Solutions - Monitors & Displays - Computer Monitors.